THE UK LABOUR party is urging all British citizens living in Ireland to make sure they are registered to vote, ahead of the upcoming general election in Britain. Theresa May’s call to hold a snap general election caught many off guard, with Brexit sitting atop the agenda. The election will be watched more closely than usual in Ireland this time around, with the looming threat of a hard border between north and south after Brexit a real possibility. Unlike Irish citizens living abroad, who are unable to vote in elections at all, British people can. UK citizens who were registered to vote in a constituency up to 15 years prior to now are eligible to vote in the upcoming general election. If you were too young to register to vote before, but your parent or guardian was registered to vote in the UK in the last 15 years, then you can still register as an overseas voter. Once registered to vote, a person can elect to vote by proxy (nominate someone else to do it) or by postal vote. According to the Census 2016 figures, there are 103,113 British nationals living in Ireland. There is little indication, however, how many of these are eligible to vote under UK voting rules. In response to a query from TheJournal.ie, the UK’s Electoral Commission was not able to provide a breakdown of the number of registered votes living in Ireland, but said that the numbers registered outside the UK is sizeable. While lots of British people have emigrated to Australia, the US and Canada, only Spain has higher numbers of UK citizens living there than Ireland in the EU. With the Brexit referendum pushing more voters to get involved, this election has a similar amount at stake as to the direction the UK will take in the future. One British national in their 30s, who wished to remain anonymous, said that they felt like this election would have a major impact on them despite having lived in Dublin for the past eight years. This massively affects us [in Ireland]. I love living here, but still want to return home one day. I dislike and distrust the Conservatives, but trust Labour and Jeremy Corbyn less. I think I’ll vote Lib Dem. Another man, in his mid-20s, had never registered to vote in the UK, but qualifies to register through his parents. Despite having no intention on living in Britain, he said it was important to vote this time around because of the implications it would have on Ireland. His parents had registered in the Berkshire constituency of Maidenhead, where Theresa May has held the seat for 20 years, and his vote is going to the Conservatives. Ahead of the election, however, UK Labour International contact for Dublin Dan O’Neill urged voters to register and opt against voting for the Conservatives, saying that it puts the Irish economy and peace process into crisis. The Conservative party press office did not respond to a request for comment on the issue of UK citizens eligible to vote here. 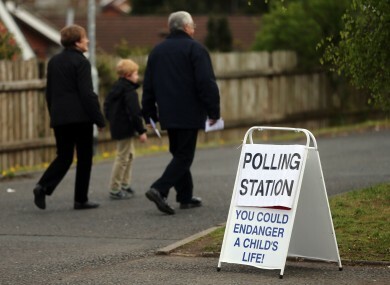 Irish citizens living in Britain, similarly, can also vote in the election. Ahead of the last general election in 2015, there was a move from the Conservative government to try to restrict this right for the Irish living in the UK. Labour MP Derek Nolan said some Conservative Party figures “want to deprive them of that right in time for this year’s election”. There is a very strong tradition of support of the British Labour Party among Irish immigrants, as there is among members of other immigrant communities, so it should come as no surprise that the Tories would stoop to measures like this in their bid for re-election. No such measures have been proposed this time around. The 2011 census showed that over 400,000 Irish nationals lived in England, Scotland and Wales. If eligible to register for the election, on 8 June, you must ensure you do it online by tomorrow Monday 22 May. Email “'It's never mattered more': Brits living in Ireland have until tomorrow to have a say in general election”. Feedback on “'It's never mattered more': Brits living in Ireland have until tomorrow to have a say in general election”.